See that cute little innocent face? Before long she’s going to be on solids, spending more and more time in her highchair stuffing her face with food, and spending her days knocking her drink bottle off the tray. I would spend endless hours picking it up and giving it back to her, she’ll have a drink, then biff it back off the edge. It’s a common game. Most kids play it. Most parents hate it, and many drink bottles break because of it. I’m here to introduce you to something that will save your drink bottles, animal’s heads, and your own sanity. The Cup Chain! Designed by a clever stay-at-home-Mum who resides in a small town called Kapunda, near the world famous Barossa Valley (wine region) in South Australia, with her gorgeous family. 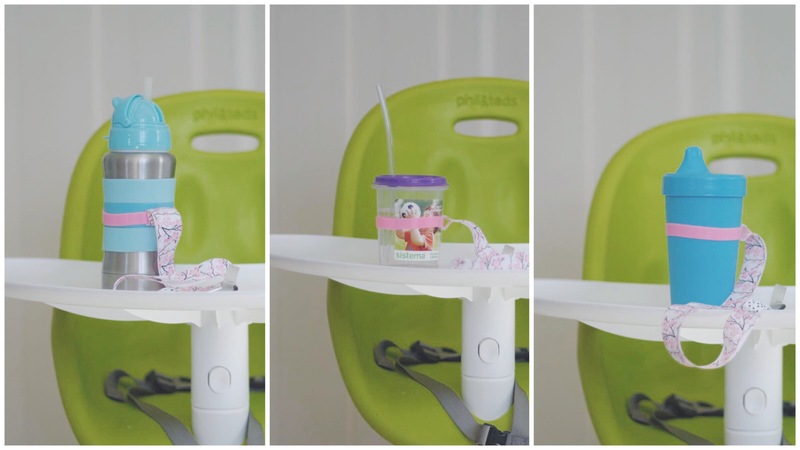 It’s as easy as using the suction cup to stick it onto your babe’s highchair tray, attaching their drink bottle/cup using the stretchy silicone ring, and you’re done! 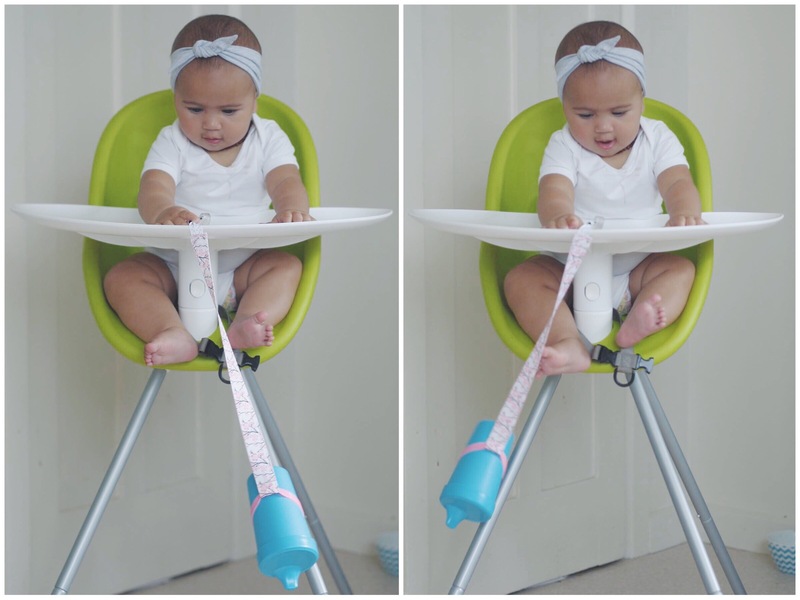 *insert smug giggle at the baby here* You can also detach the chain from the suction cup and use the fastener to attach it to their buggy/pram straps! So they can’t chuck it out of the pram while you’re out walking, yay! You would have read above that Marlo isn’t actually on solids yet, however she does spend a few times a day hanging out in the highchair while I’m busy in the kitchen. So I assure you, she has been putting her Cup Chain to the test well and truly! It’s been suctioned on for 2 weeks without coming off. I’ve tried it out on different sized drink bottles with and without water (different weights, photos below), the silicone ring has always held on tight. Winning! Super affordable, it’s only $13NZD including postage (un-tracked) from Australia! I think this is the coolest wee product! Would make an awesome baby shower gift, too. 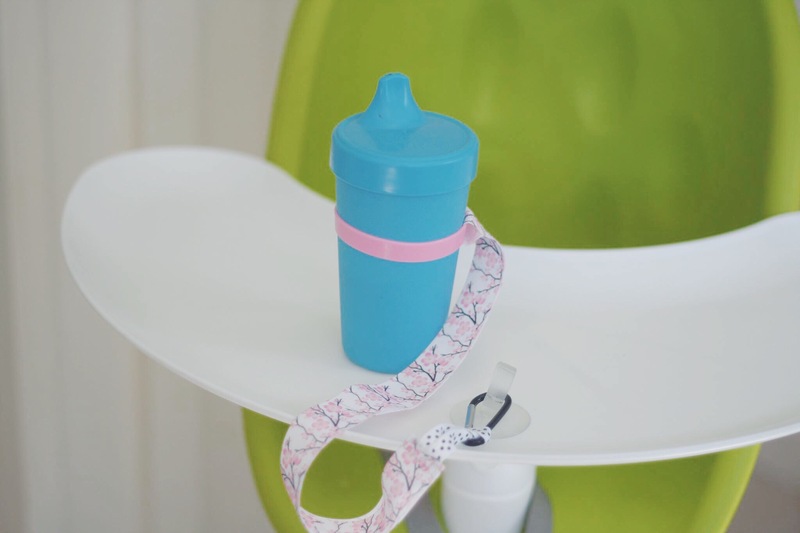 You can get your own Cup Chain from Bottoms & Bibs on Facebook. The drink bottles/cups below from left to right are: Haakaa stainless steel straw bottle, Sistema dinkee cup, Replay Recycled spill proof cup. Marlo’s highchair is a Phil & Teds Poppy and she is wearing a headband from Lewis & Lou.